If you have ridden, walked, run, hiked a trail in our area, chances are that Thomas Jenkins had a hand in designing, building, or maintaining the trail. Thomas took the lead project manager role for all three of our $500,000 worth of Recreational Trails Program Grants in the George Washington National Forest. Thomas has also led our Massanutten Western Slope trail building efforts for over a decade. Congrats Thomas! A well deserved recognition for the many years of hard work and commitment to building more trails for all of us to enjoy. Bicycle Coalition Member Jess Daddio profiled Thomas in a post on the REI Co-Op Journal as one of the “Toughest Trail Builders Around.” If you have been up on the new “Puzzler” trail this year at the Western Slope you have seen the magnificent rock work and grand vision that Thomas is making a reality by empowering our volunteer trail builders. Wedged between the Blue Ridge Mountains to the east and the Allegheny Mountains to the west, Virginia’s Shenandoah Valley contains a unique blend of fertile fields and craggy ridgelines. That diversity in terrain has turned Harrisonburg, Virginia, from a quaint college town to a bustling biking mecca; less than 30 minutes away are some of the largest national forests in the east, the George Washington and Jefferson National Forests. What this area lacks in elevation—one of the highest points, Reddish Knob, is just under 4,400 feet—it makes up for twofold in the sheer number of rocks. Mountain biking here is notoriously technical, which is what initially drew Shenandoah Valley Bicycle Coalition cofounder and bike shop owner Thomas Jenkins to Harrisonburg (aka “Rocktown”). As a trail builder, his rock sidewalks and rock bridges have become hallmarks of the local singletrack, but hand-building trail out of sandstone boulder fields (where rocks can weigh upwards of two tons) presents its own set of challenges. 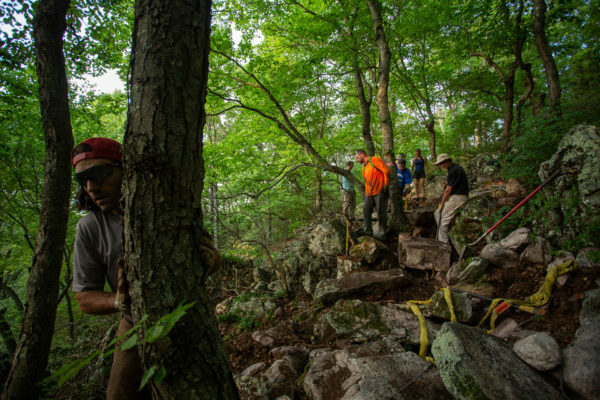 One of the most impressive of Jenkins and the coalition’s hand-build projects is the 2,000 Hours Trail located on Massanutten Resort’s Western Slopes. Named for the 2,000 person-hours it took to complete the mile-long trail, “2K” is a masterpiece of buttery berms, seamless step-ups and step-downs, and those iconic rock sidewalks. ← 12/7: Ride Bicycles in the Harrisonburg Holiday Parade!